NEWS YOU CAN USE: The contemporary significance of the dead sea scrolls (Timothy Lim, OUP Blog). 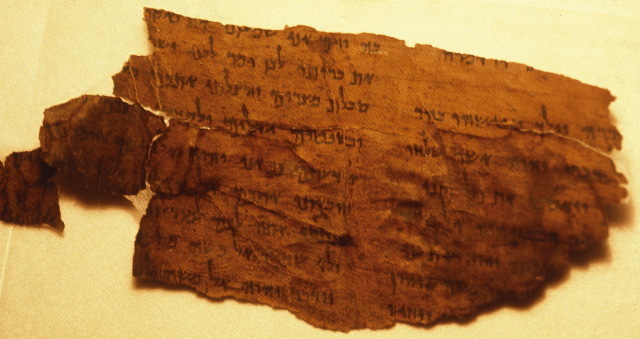 Many people have heard of the Dead Sea Scrolls, but few know what they are or the significance they have for people today. This year marks the 70th anniversary of the discovery of the Dead Sea Scrolls, and it gives us an opportunity to ask what are these scrolls and why they should matter to anyone. Fighting over the Bible explores the bitter conflicts between main stream Jews and their internal and external opponents, especially between particular Jewish groups such as Pharisees, Sadducees, Qumranites, Samaritans, Rabbanites and Karaites, as well as with Christians and Muslims regarding their interpretations of Jewish Scripture. The Hebrew Bible/Old Testament is an important sacred text for all branches of the Abrahamic faiths, but it has more often divided than unified them. This volume explores and exemplifies the roots of these interpretive conflicts and controversies and traces the rich exegetical and theological approaches that grew out of them. Focusing on the Jewish sources from the late Second Temple period through the high Middle-Ages, it illustrates how the study of the Bible filled the vacuum left by the Temple’s destruction, and became the foundation of Jewish life throughout its long conflicted history. READING ACTS: What is the Roman Imperial Cult? Past posts in Phil Long's series on the Greco-Roman world are noted here and here. And, again, last year's Divine Sonship Symposium at the University of St. Andrews is very relevant to this post. A roundtable discussion on Jesus’ death, burial, and resurrection led by Professor Helen Bond, with Dr. Sara Parvis and me participating is available now here. Bond commences with queries about how Jesus’ corpse was handled after his crucifixion, whether it was in fact buried or simply discarded, and whether figures such as Joseph of Arimathea may have been involved. Cross-file under CSCO Easter Series. Thus it should be noted that at Caesarea Maritima the imperial cult founded by Herod the Great was still being practiced AND that Pilate as a good governor was also promoting the Imperial Cult—adding a structure for the worship of the ruling Roman emperor, Tiberius (14–37). All of this going on during the time of Jesus’ public ministry (ca. 26–30)! I can't remember if this inscription came up during the St. Andrews Symposium on Divine Sonship last June, but it certainly would have been of interest. Cross-file under Easter is Coming. MEREDITH WARREN: What Would Jesus Eat This Easter? A First Century Menu For The Last Supper (History Matters Blog, University of Sheffield). Cross-file under News You Can Use. Let me also take this opportunity to congratulate Dr. Warren, whose temporary post at the University of Sheffield was recently made permanent. It's great to have her settled now on this side of the pond. For more on her work, see here and links. CSCO EASTER SERIES: Resurrection in Judaism (Video; Professor Timothy Lim). BOOK REVIEW: Rabbi Akiva Made the Jews Who They Are Today, Says Biographer (David Holzel, The Jewish Exponent). What we think of as Judaism today — from the religion practiced by the haredi Orthodox in contemporary B’nai Brak, Israel, to the lack of religion of secular Jews — was created by the rabbis in the centuries following the destruction of the temple in Jerusalem in the year 70. If there was a quintessential rabbi in the group, said [Barry] Holtz, a professor of education at the Jewish Theological Seminary of America, that man was Akiva. “He was the smartest one in the room,” he said. Holtz has written what he calls an “imagined biography” of Akiva, who lived in the first and second centuries CE. This enigmatic story became part of the foundation of the Jewish mystical tradition. In his exploration of the “Orchard Story” or the “Pardes Story,” Holtz looks at what the four were doing, and why only Akiva seems to have returned unscathed. The book was noted as forthcoming here. For more on the Story of the Four Who Entered Paradise, see here and links. A review copy kindly sent to me by the publisher. I will be reviewing the book in the Mysticism, Esotericism, and Gnosticism (MEGA) Section at the annual meeting of the Society of Biblical Literature in Boston in November of this year. I noted the publication of the book last year here. The site of Jesus' crucifixion? THE HOLY LAND PHOTOS BLOG: Site of Crucifixion of Jesus? Probably the most sacred place in the whole of Christendom is the Church of the Holy Sepulcher (aka Church of the Resurrection) in the Old City of Jerusalem. Since the first half of the fourth century a church has encased both the places of crucifixion and burial of Jesus. Since today is Good Friday. As generally with such things, this place enshrines a tradition about the site where Jesus was crucified. It's a comparatively old tradition, but one warranting some skepticism. Whether or not there was a genuine memory of the actual site of the event, inevitably someone would have come up with one. For the question of the site of Jesus' burial, see here and links. ANCIENT JEW REVIEW: Theorizing “the Ancient Economy”: Three Paradigms (Thomas R. Blanton IV). It would seem that the study of “the ancient economy” is in a period of ferment. Three new SBL program units have been added since 2004 that treat aspects of the ancient economy: Early Christianity and the Ancient Economy, Economics in the Biblical World, and Poverty in the Biblical World. In the field of classical studies, the 2008 publication of The Cambridge Economic History of the Greco-Roman World has effectively ushered in a post-Finleyan era in the study of Greco-Roman economies by incorporating methods developed in the field of New Institutional Economics. In what follows, we examine representative samples of three emergent methodological trends: (1) the turn toward New Institutional Economics in studies of Greece and Rome; (2) Roland Boer’s model of the economy of ancient Israel; and (3) K. C. Hanson and Douglas Oakman’s social-scientific approach in New Testament studies. These models differ significantly from each other and are drawn from what are often treated as three distinct fields: classics, Hebrew Bible, and New Testament studies. It is precisely the differences between the models that are most illuminating, however, and juxtaposing them quickly reveals the emphases—and omissions—that are specific to and that characterize each model. THE ASOR BLOG: Hebrew as the Language behind the World’s First Alphabet? (Douglas Petrovich). To be honest, I am surprised that ASOR published this essay. Dr. Petrovich's theory has never been published in a peer-review venue and it has nevertheless been refuted informally in detail by specialists in Northwest Semitics and Egyptology. The very statement that the Proto-Sinaitic inscriptions were written in "Hebrew" doesn't make any sense to specialists. There was no "Hebrew" in the early second millennium BCE. There were various dialects of Northwest Semitic, some of which would someday develop into Hebrew, Aramaic, Phoenician, Moabite, etc. Past PaleoJudaica posts on Douglas Petrovich's claims are here, here, here, and here. TEMPLE MOUNT WATCH: Watch: Priestly blessing at Western Wall. Thousands attend special annual Passover 'Birkat Kohanim' service at Western Wall in Jerusalem (Arutz Sheva). Thousands flocked to the Western Wall Plaza in the Old City of Jerusalem Thursday morning for a special holiday service of the Priestly Blessing (Birkat Hakohanim) for the Passover festival. With video. For biblical and epigraphic background on the priestly blessing, see last year's post here and last year's post on the Sukkot priestly blessing here. CONGRATULATIONS TO FATHER FRIZZELL: Father Lawrence Frizzell, Luna Kaufman, Pearl Randall Lehrhoff and Hattie Segal honored at 24th Evening of Roses on May 7; Special Appearance by Scholar Amy-Jill Levine (Laurie Pine, Seton Hall University). Father Lawrence E. Frizzell will be honored for a lifetime of work and scholarship, receiving the first ever Sister Rose Thering Fund Award in Jewish Christian Understanding on Sunday, May 7, at the 24th annual Evening of Roses fundraiser. Father Frizzell is Director and Associate Professor of the Jewish-Christian Studies Graduate Program in the Department of Religion. Father Frizzell, D.Phil. (Oxford University), S.S.L. (Pontifical Biblical Institute, Rome), S.T.L. (University of Ottawa) is a priest of the Edmonton Archdiocese in Alberta, Canada. He came to Seton Hall University in 1974 to help found the master's program, which in 1979 became the Department of Jewish-Christian Studies. He was also Associate Director of the Institute of Judaeo-Christian Studies, founded in 1953 by Msgr. John M. Oesterreicher. Since 1993, he has served as director of this Institute, which promotes understanding of the Christian roots in the Jewish matrix of the Second Temple period and, through lectures and publications, strives to increase understanding and amity between Jewish and Christian communities. Principles of Jewish-Christian dialogue may be applied to other communities seeking justice, peace and greater mutual understanding. For decades Father Frizzell has developed a personal interest in peace studies and, in a limited way, an appreciation of the cultures of East and South-East Asia. His doctoral dissertation was on the theology of the community that produced the Dead Sea (Qumran) Scrolls. Besides publications in biblical and Jewish studies, he wrote entries for the World Encyclopedia of Peace (Oxford: Pergamon Press, 1986, revised 1999) and the Dictionary of Christian-Jewish Relations (Cambridge University Press, 2005). And congratulations also to the three trustees who are being honored. THE HOLY LAND PHOTOS BLOG: Bone Box of Caiaphas the High Priest. I noted the discovery of this ossuary back in 2008 here. Also, in 2011, the IAA announced the recovery (from looters) of an ossuary that was inscribed "Miriam Daughter of Yeshua Son of Caiaphas Priest of Ma'aziah from Beth ’Imri.’" (The punctuation is uncertain.) The IAA has judged it to be genuine. More on that ossuary is here and links. Cross-file under Easter is Coming. Unlike other ancient traditions, the literature of Greece and Rome does not develop a mythology of the End of Days. Its few philosophical texts that explicitly address the question of whether the world will end, and the place of humans in such scenarios, are, however, only one part of the story of eschatological thinking in antiquity. Images of our collective future, like images of our past, are motivated by constructions of the present, and may be spun different ways to make different points, with explicit or implied consequences for our current place in the world. Various rhetorical functions of adopting an 'apocalyptic' mode, such as consolation for death, subversion of tyrannical powers, revelation of 'scientific' truths, or satire of religious clichés, emerge through framing and form as well as content. They contribute not so much to a thesis as to a discourse. This conference aims to explore such a discourse in Graeco-Roman literary culture, focusing on ancient texts in which a revelation of a collective destiny plays a significant role. We shall consider both 'cosmic revelations' and 'looking to the end of history' as aspects of apocalyptic eschatology in material from the Greek and Roman worlds; through highlighting such rhetoric, we aim to shed fresh light on a variety of ancient authors, from Aeschylus and Plato to Lucretius and Seneca; we will also consider Jewish pseudepigraphical texts and early Christian expositions which thrive on tensions between the working out of divine plans already made and semi-revealed to mortals, and the irruption of the heavenly into the earthly world. Follow the link for further particulars and a provisional schedule of papers. The relevance of the topic for anyone interested in Jewish and Christian apocalypses and apocalyptic eschatology is obvious. HT Paul Middleton on the BNTC List. So the demons don't know Aramaic either? PHILOLOGOS: Why the Beginning of the Haggadah Is in Aramaic. It’s because of demons (Mosaic Magazine). Aramaic was ordained because were one to say in Hebrew “Let whoever is hungry come and eat,” it would be as though also inviting the evil spirits. . . . But the evil spirits do not know Aramaic. We do not welcome strangers to our seder in Hebrew, in other words, because the world’s demonic legions, who understand Hebrew and Hebrew alone, might then decide to crash the party. What a charming but strange notion! Where does it come from? It seems to be an inference based on the Talmud's statement that angels don't know Aramaic. Cross-file under Passover. By the way, it is good to see Philologos active again. He was last noted by PaleoJudaica back in 2014. It seems he has moved from The Forward to Mosaic Magazine, which is news to me. It is well–known from literature that the Romans crucified rebels and criminals. In 1968, an ossuary (bone box; see below) was found, among others, in a tomb in north Jerusalem in which were the bones of a 28 year old man and those of a child. Past posts on the crucified man skeleton and related matters are collected here (cf. here). READING ACTS: Characteristics of Greco-Roman Religions. Past posts in Phil Long's series on the Second Temple Period are noted here and links. But we seem now to have moved on to the Greco-Roman world, which is still interesting for ancient Judaism. EXHIBITION: Manuscripts shed light on early days of Christianity (, Belfast Telegraph). Some of the oldest surviving biblical manuscripts are on display in Dublin. The texts, which caused a global sensation in 1931 when they were bought by Sir Alfred Chester Beatty, contain both Old and New Testament books and date from 200 to 400AD. And as Easter approaches, the library named in the collector's honour is showing St Paul's Letter To The Corinthians, which recounts how Jesus Christ died, was buried and rose again. Jill Unkel, curator of the Western Collection at the Chester Beatty Library, said: "It's a very, very significant collection. "It's the earliest collection of Pauline epistles on book. There are surviving fragments dated earlier but it's the earliest known collection. Among them are The Book Of Numbers, which was the oldest surviving book of the Bible until the Dead Sea Scrolls were unearthed. I'm skeptical of this claim, but I would have to see the details. As I have mentioned before, I am very much looking forward to visiting the Chester Beatty Library in September during BNTC 2017. Background on the Chester Beatty Library is here and links. ANCIENT JEW REVIEW: The Aramaic Language of the Dead Sea Scrolls: Why it Matters and What Lies Ahead (Daniel Machiela). The cache of Aramaic literature that gradually emerged from the caves near Qumran provides us with an important new window onto Judaism of the Second Temple period. Some of these scrolls furnished early, original-language witnesses to books about which we had previously known only through later translations – for example, 1 Enoch and Tobit – or the Jewish and Christian biblical canons, as in the case of Daniel. Most scrolls, however, offered tantalizing glimpses of Aramaic works that had been lost completely (e.g., the Genesis Apocryphon and Visions of Amram), or were merely echoed in later, significantly-altered writings in Greek (see the Aramaic Levi Document, a source for the Testaments of the Twelve Patriarchs). In the Aramaic Job copies from Cave 4 and Cave 11 we retrieved our only certain translation of a Hebrew book. Now, with the relatively recent full publication of the Aramaic texts from Qumran, primarily by Émile Puech, we can begin to study these texts as a group, and to appreciate the sum of this material as the skeletal remains of a broad Jewish literary movement. The most studied and consequential aspect of the Aramaic scrolls to date may well be their Aramaic language. There are several good reasons for this. An excellent distillation of linguistic issues involving the Aramaic texts from Qumran and a fine contribution to AJR's "Aramaic month." Earlier essays in AJR's current series on the Dead Sea Scrolls (in honor of the 70th anniversary of their discovery) are noted here and links. MONOTHEISM: Have we been misinterpreting the Second Commandment all along? 'Thou shalt have no other gods before me' can be taken in different ways, one being, Me first, the godlets next (By Elizabeth Sloane, Haaretz). The Second Commandment is generally interpreted as meaning that the Jewish people should worship only one god, YHWH, and that there is no other god. However, the qualification “before me” have led some scholars to debate whether that was the original meaning of the commandment ostensibly handed down to Moses on Mt. Sinai, in around 1400 BCE. Far from forcing people to give up the worship of other deities, some scholars theorize, the commandment actually laid down a heavenly hierarchy, with YHWH at the top. YHWH was to be worshipped and sacrificed to first, before any other gods. Then they could get theirs. That is a possible reading of the second commandment, although Deuteronomy and the Priestly writer make it pretty clear that no god but YHWH is to be worshipped at all. There are a number of questions here to which we don't have good answers. One is the meaning of the second commandment. Another is to what degree any strict monotheism was the standard of a particular group in ancient Israel rather than the mainstream standard. And even if, say, the Judean royal cult tied to the Jerusalem Temple held to strict monotheism (which does not seem implausible), that doesn't tell us what people out in the rural areas were doing. You don't have laws against something unless it happens often enough to be a problem. And there is also the question of what was going on in the Northern Kingdom of Israel. Certainly, the practices of worshipping a divine pantheon arose from deep antiquity: It can be traced archaeologically from the Iron Age (10th – 6th centuries B.C.E.) through to the Babylonian Exile. Inscriptions from around Israel from the Iron Age bear the name of “Ashera”. An 8th century tomb in Khirbet el Qom, between Hebron and Lachish, in the territory of the Biblical kingdom of Judah, has a prayer inscribed in it invoking YHWH and Ashera. The location of this site in Judah strongly suggests that the inscription is Judahic. Also, numerous Inscriptions in Kuntillet Arjud, in the Northeast part of the Sinai Peninsula, are dedicated to “YHWH and his Ashera.” While this site was not in Judah itself, the inscriptions were written in Hebrew, making it clear the site was Judahic. The Kuntillet Arjud inscriptions refer to "Samaria" and thus at least some of them are probably associated with the Northern Kingdom. Good article. Read it all. THE FORBIDDEN GOSPELS BLOG: Gnosis 2.1 is published! (April DeConick). The full title is GNOSIS: Journal of Gnostic Studies. Follow the link for the TOC. Not surprisingly, there is a lot on ancient Gnosticism. But ancient Judaism is represented too. TEMPLE MOUNT WATCH: 17 held for attempts to ‘sacrifice’ goats in Jerusalem. Six animals seized by authorities in Old City; police check vehicles for goats to prevent activists from carrying out Biblically commanded offering (Stuart Winer, Times of Israel). Police said they detained at least 17 people over the course of Monday in Jerusalem over a number of suspected attempts to sacrifice kid goats for the Passover holiday. Six goats were seized and transferred to the Agriculture Ministry’s veterinary service, police indicated. Police believe the suspects were en route to the Temple Mount to perform the act, in an attempted reenactment of the Passover sacrifice as described in the Bible. They aren't giving up easily this year. Background and commentary here and here and links. NEWS YOU CAN USE: 10 Hebrew Words to Know for the Passover Holiday ( Tsivya Fox April, Breaking Israel News). HAPPY PASSOVER TO ALL THOSE CELEBRATING! The festival begins this evening at sundown. Last year's Passover post is here and it will lead to an earlier post with the relevant biblical texts. The 2015 Passover Post also has some interesting material. PaleoJudaica has had unusually many Passover-related posts in the last year, particularly in the last week or so. See here, here, here, here, here, here, here, here, here, here, here, here, here, here, and here! READING ACTS: Greco-Roman Religions and the New Testament. Greco-Roman Religions might be considered “the competition” of early Christianity, but this is not a fair description of how religions functioned in the first century. First, in the first century, religion was rarely a choice. A person owed worship to a god because of a civic or family obligation or because the god is associated with a trade. A person living in the Roman world would not even think in terms of “converting” from one god to another, since gods had various functions; motivations were purely practical. If one was going to sea, one appeased sea gods. In fact, the idea of choosing to worship a particular god was the attraction of the mystery cult. One might become a worshiper of Mithras by choice, although obligated to also worship other gods. Some of the papers at the St. Andrews Symposium on Divine Sonship last June dealt with this topic. PASSOVER IS COMING, EGYPTIAN MAGIC EDITION: Dr. Flora Brooke Anthony has two essays at TheTorah.com which tell you what you need to know about ancient Egyptian magic. Including one who makes a golem. The fables that the ancient Egyptians told of their magicians certainly influenced non-Egyptian story-tellers, who wrote their own stories about this colorful caste of people. The legendary effectiveness of Egyptian magic were appreciated by these ancient non-Egyptian storytellers, even if they did not quite understand the Egyptians’ specific beliefs about their gods, how spells work, or the role that magic (ḥeka) played in the ancient Egyptian world view. The all pervading cosmic force. עשרה קבים כשפים ירדו לעולם, תשעה נטלה מצרים [ואחד כל העולם כולו]. Ten measures of witchcraft descended to the world; nine were taken by Egypt [and one by the rest of the world]. Is that really what ancient Egypt was about? Spoiler: the answer is no. UPDATE: This recent post deals with Egyptian magicians as portrayed in the Bible. An Egyptian stone finger sifted out. TEMPLE MOUNT WATCH: As they bid for survival, archaeologists point to ‘Egyptian’ finger from Temple Mount. Inch-and-a-half-long stone fragment may be from Late Bronze Age Egypt, Temple Mount Sifting Project says, but research and funding needed to ascertain it (Ilan Ben Zion, Times of Israel). In an statement timed just ahead of Passover, the Temple Mount Sifting Project said Sunday it had found a stone finger that may have belonged to a Bronze Age Egyptian statue, but conceded it wasn’t sure. The unusual announcement may have been an attempt to keep up pressure on Israeli authorities to resolve a funding crisis that has brought its operations to a halt. The project, which has been in dire straits in recent weeks after its main donor, the City of David Foundation, pulled its funding, made the announcement of an Egyptian find ahead of the Jewish festival marking the Biblical story of the Exodus from Egypt. In the statement released by the Temple Mount Sifting Project to the press, [project director, Gabriel] Barkay was more authoritative in his assertions about the artifact than he was in conversation on the phone. Background on the Temple Mount Sifting Project is here and here and many, many links. Cross-file under Passover is Coming. TEMPLE MOUNT WATCH: 7 arrested to prevent Temple Mount paschal sacrifices. In a stated attempt to prevent flaring tensions at the Jerusalem flashpoint, the Israel Police arrested 7 activists who had stated their intention to sacrifice goats there Monday (Roi Yanovsky, Arutz Sheva). The Israel Police arrested seven right-wing Jewish activists to prevent their offering caprine paschal sacrifices at Jerusalem’s Temple Mount on Monday, the eve of the Passover holiday. The six are member of the Return to Temple Mount movement, and they have been publicly calling on the Jewish public to partake in the ritual sacrifice of goats at the Old City’s flashpoint before the festival. Every year, activists come to the gates of the Temple Mount with goats and their kids to sacrifice them, and they are usually arrested by the police. Related story and some relevant commentary here and links. Cross-file under Passover is Coming. For more on Papyrus Amherst 63 see here, here, and here. For many past PaleoJudaica posts on Elephantine and the Elephantine Aramaic papyri, start here and follow the links. This issue of JNES also has some other articles and reviews that may be of interest, so have a look at the TOC. A personal or institutional subscription is required for full access. PASSOVER IS COMING: The Plague of Dead Fish (Dr. Rabbi David Frankel, TheTorah.com). Moses striking the Nile to kill the fish and make the water stink eventually developed into the plague of blood: a case of mythological amplification and its reverse. Interesting possibility, but I don't find the case compelling. PASSOVER IS COMING: Despoiling the Egyptians: A Concerning Jewish Legacy? (Prof. Leonard Greenspoon, TheTorah.com). How 19th century Anglo-Jewish translators defended the Israelites’ behavior against the King James translation’s perceived accusation that the Jews “borrowed” the Egyptians belongings and never returned them. In both the rabbinic story and the modern attempt, the lawsuits went nowhere. Yet, they reflect Jewish anxiety about how the story of the despoiling of Egypt can be used against us, and offer an important lesson. For those seeking to discredit the Book, or the People of the Book, there is no concept of a statute of limitations and no desire to try and understand this account in its literary or historical setting. It merely serves as a useful pretext for anti-Jewish stereotyping. This cannot determine our translations, which must follow philology and context, but we should always remember what is at stake in any given choice. ISRAEL ANTIQUITIES AUTHORITY PRESS RELEASE: The Sanhedrin Trail - the First Interactive Hiking Trail of its Kind in the Country. The large project involves thousands of students and volunteers who will excavate and prepare a new trail that is among the longest in the country. The authors of the Passover Haggadah will be at the focal point of a new interactive trail – the first of its kind in Israel. The Sanhedrin Trail is currently being constructed in Tiberias and will be 70 kilometers long! It will cross the Galilee from Bet She?arim to Tiberias and will pass between sites that are associated with members of the Sanhedrin. Work on the first section of the trail has already begun with pupils from the National Religious Education system of the Ministry of Education and volunteers participating. The Sanhedrin Trail will cross the Lower Galilee by way of many of the sites that were inhabited during the time of the Mishnah and Talmud. The activity of the Sanhedrin – the foremost body of Jewish leadership and supreme authority during the Second Temple period – was exiled to Yavne after the destruction of Jerusalem, and from there to the Galilee following the Bar Kokhba revolt in 135 CE. From the difficult identity crisis that the people experienced in the wake of the destruction of the Temple, and led by the seventy sages and the president of the Sanhedrin, a renewed work of Jewish law, philosophy and culture was developed. The Oral Law was recorded for the first time, and the Mishnah and Talmud were written. As part of this activity, the Passover Haggadah was also written, which cites the dialogue of a meeting of the members of the Sanhedrin after the destruction of the Temple in which they discussed the appropriate ways to mark Passover outside the ruined Temple and laying out the new spiritual path of the people of Israel (“It happened that Rabbi Eliezer, Rabbi Yehoshua, Rabbi Elazar ben Azaryah, Rabbi Akiva and Rabbi Tarphon were reclining [at a seder] in B'nei Berak. They were discussing the exodus from Egypt all that night, until their students came and told them: "Our Masters! The time has come for reciting the morning Shema!"). Their bold-font emphasis. Cross-file under Passover is Coming. Where is the Temple menorah? CANDIDA MOSS: What Happened to the Jerusalem Temple’s Menorah? Every year, the Vatican receives hundreds of requests to return the menorah of the destroyed Jerusalem Temple. The only problem? They don’t have it. (The Daily Beast). If the menorah isn’t in the Vatican being used as a reading lamp for secret books in a nefarious underground basement (it’s not—the only obstructions for scholars trying to enter the Vatican libraries are administrative), then where is it? According to the first-century Jewish historian Josephus, the menorah was placed in Vespasian’s newly built Temple of Peace, not far from the Arch. It seems to have resided there at least until the third century, if not until the Ostrogoth Sack of Rome in the fifth. The suggestion that it was thrown into the Tiber during a time of chaos is implausible. As Fine told me, ancient artifacts frequently go missing, but gold artifacts do not. They get recycled, often being minted as coins. It’s possible that the Vandals melted down the menorah after they sacked the city in 455 C.E. All that sounds right to me. PaleoJudaica has been following the story of the Temple menorah for a long time and there are many posts on the various theories about what happened to it, as well as on the Arch of Titus, on Professor Fine's recent book The Menorah, and on the groundless conspiracy theory about it being held by the Vatican. Start here and follow the links.